Moon / September 28, 2016 / L.A.
Do you ever feel a negative energy in your home? Feel unmotivated, stuck, or even depressed? I’m sure most of you have. I’m very sensitive to energies in general. When the energy is not right in my home you can best believe nothing is getting done. Good thing I have built an awareness to this so I can “clear the air.” Stagnant or negative energy can really stress your mental, emotional, energetic, spiritual/physical body, and your environment. Luckily, we can use sage to give our homes and our bodies an energetic cleansing. What is Sage Cleansing and How Does It Work? Smudging, Sage-ing, or sage cleansing originated from the Native Americans is is done by burning dried white sage leaves. Smudging is done to cleanse your energetic fields. It promotes a happy, peaceful, creative, and balanced home and does so by changing the ionic composition of the air. The theory behind this burning ritual is that the smoke will attach itself to negative energy and as the smoke clears away it takes the negative energy with it. The smoke is a purifying agent that creates harmony and a more positive mood by releasing negative ions. Virtually all particles in the air have a positive charge, while negative ions have a negative charge. In which case, negative ions and particles magnetically attract to one another. When there is a high enough concentration of negative ions in the air, they will attract to floating particles in large numbers. This causes the particle to become too heavy to remain airborne. As a result, the particle will fall out of the air, and will then be collected by normal cleaning activities, such as vacuuming or dusting. Negative ions restore and neutralize air quality. Our homes and offices are filled with electrical appliances and electronics. Use of such devices have been blamed for lowering our energy levels, making us feel tired, cranky, and depressed because of their emissions of positive ions. Balancing positive and negative ions also help reduce airborne infections. 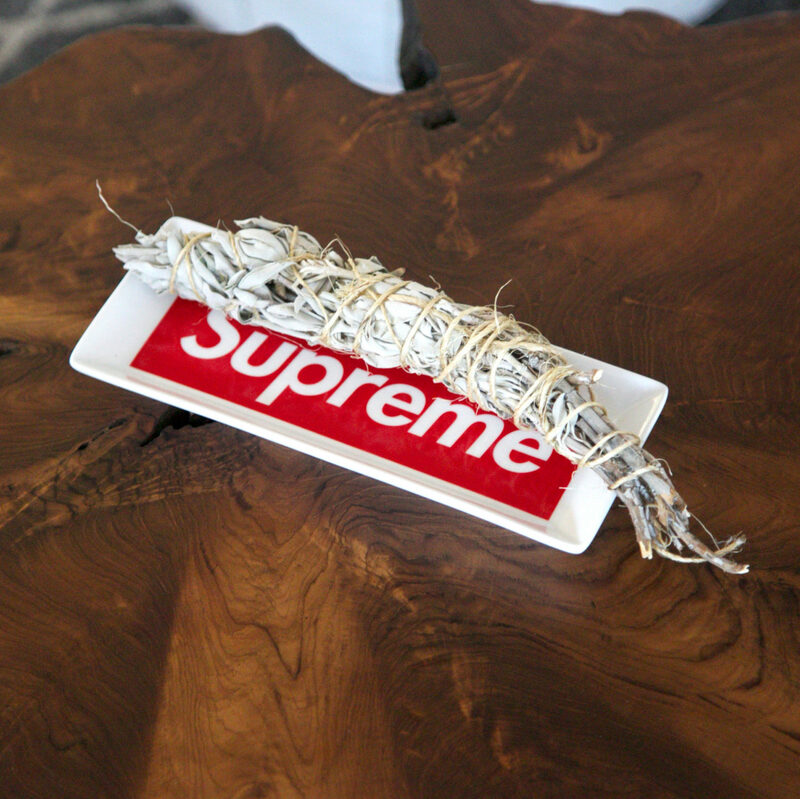 Like incense, light the white sage bundle until it smokes, if a true flame appears gently blow it out until it’s just smoking. Starting with all the windows and doors shut at the farthest room. Begin waving/fanning the sage smudge around the perimeter of each room – ceilings, corners, floors, windows, and doorways. If you want to ward of negative energies from coming in thru windows you can draw an “X” across it. After the perimeter of the room is completed, go into the center of the room waving all around in there and move on to the next room and do the same thing. After all rooms are completed open a window or door to allow all the negative energy to leave the space. This should be done with intention as though you are performing a sacred ceremony. If you aren’t sure what to say try something like “May this space be cleared of energies that are not serving me. May my home be filled with peace and love.” You should allow the smoke to clear out naturally. You should notice a calming effect throughout the area being cleansed within 30 minutes. You can never really sage too much. Sage daily, weekly, monthly, or yearly. I’ve had to sage after arguments in the house or a friend coming over in a stressful or angry state. People unintentionally leave energies behind, you bring energies from outside situations into your home. Yes, this is a metaphysical thing, believe in it or not. It’s totally up to you. I personally don’t think I sage enough. For example if I’m not motivated or feeling sluggish, I really feel it cures me. Leave your sage smudging experiences in the comments below. Thanks for reading. Namaste.